The tall and sturdy banana plants are often called banana trees or banana palms, but both these terms are erroneous, as the plant is actually a huge herb, whose ‘trunk’ consists of thick layers of modified, closely packed leaf-stalks, forming a so-called pseudostem (false stem), also called a corm. These plants, comprising c. 30 species of the genus Musa, are native to subtropical and tropical areas, from India eastwards to Taiwan, and thence southwards through Southeast Asia, Indonesia, and New Guinea to northern Australia. Bananas were probably first domesticated in New Guinea, and today they are cultivated worldwide in warmer countries. Most are grown for their edible fruits, raw or cooked, the latter often called plantains. Other types are cultivated for their fibres, to make wine and beer, or as ornamentals. Today, almost all edible bananas are cultivars of two wild species, Musa acuminata and M. balbisiana, and the hybrid between them, called Musa × paradisiaca. Formerly, the scientific name of edible bananas was Musa sapientum, which is no longer accepted. Other species of banana include the scarlet Musa coccinea and the pink M. velutina, and the term also refers to members of the genus Ensete, likewise in the banana family (Musaceae), including snow banana (E. glaucum) and false banana (E. ventricosum). Banana leaves grow in spirals and may be up to 2.7 m long and 60 cm wide. These huge leaves have a wide range of usage, being both flexible and waterproof. They are much used for wrapping, including in cooking, where various foods are often wrapped in the leaves before being steamed. In various Hindu and Buddhist ceremonies, the leaves are used as decoration, often having a symbolic meaning. In former times, in South and Southeast Asia, banana leaves were used as writing material. Before the introduction of plastic materials, they were also utilized in many areas as rain ponchos. The huge banana leaves are often tattered, torn by the wind. Withering banana leaves often show very beautiful patterns. When a banana plant is mature, a harder stem develops inside the pseudostem, emerging at the top of the plant, carrying a single, huge inflorescence. The fruits grow in several large clusters, sitting in rows down the stout flower stalk, each containing between 10 and 30 bananas. They are so heavy that the stalk is bent downwards. The Taiwan banana (Musa formosana), which grows to 6 m tall, is endemic to Taiwan, growing on forested slopes, from near sea level to c. 1,000 m altitude. Monkeys and apes love bananas, as is evident from the following three pictures. – Read more about these animals elsewhere on this website, see Animals: Monkeys and apes. Orangutans are closely related to humans – a fact which is also seen from their name, which means ‘Forest Man’ in the Malay, from orang (’Man’), and utan (’forest’). Formerly, orangutans were regarded as a single species, Pongo pygmaeus, confined to rainforests of Sumatra and Borneo. Lately, however, it has been split into three separate species, the Bornean orangutan (P. pygmaeus), found in Borneo, the Sumatran orangutan (P. abelii), which is restricted to northern Sumatra, and the Tapanuli orangutan (P. tapanuliensis), which lives in an area of just 1,500 km2 in central Sumatra. During the last century, orangutans have declined drastically and are now in danger of extinction, the main reason for the decline being habitat destruction, as areas of rainforest have been cleared by the timber industry and converted into oil palm plantations and farmland. Another reason is that poachers shoot female orangutans to get hold of their young, which are sold to zoos or others. In Borneo, a number of rehabilitation centres for orangutans have been established. At these centres, orphaned young orangutans, which have been confiscated from poachers, are trained to live in the forest, after which they are released into safe areas, such as national parks. In 1985, I visited the Sepilok Orangutan Rehabilitation Centre, near the town of Sandakan, Sabah. Read about this visit elsewhere on this website, see Travel episodes – Borneo 1985: Visiting orangutans. Of the 23 species of macaque (Macaca), the long-tailed macaque (M. fascicularis) is the most widespread, found from Bangladesh, Myanmar, Laos, and Vietnam, south to the Indonesian Archipelago, and thence east to the Philippines. 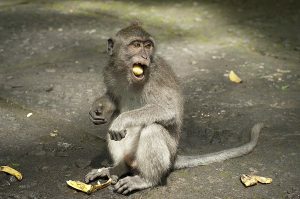 This species, which is also called crab-eating macaque, lives in a wide range of habitats, including mangrove, forests, agricultural areas near forest, and temple groves. The rhesus monkey (Macaca mulatta) is the well-known brown monkey of India, found almost everywhere in the country north of the Tapti and Godavari Rivers. Its total area of distribution is from Afghanistan eastwards through Pakistan, India, Nepal, Bangladesh, Myanmar, Thailand, Laos, and Vietnam, and thence north to central China.